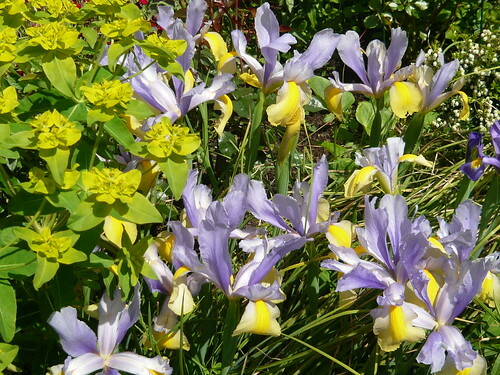 Some of our favourite plant and garden photographs not featuring in other gardeners tips. 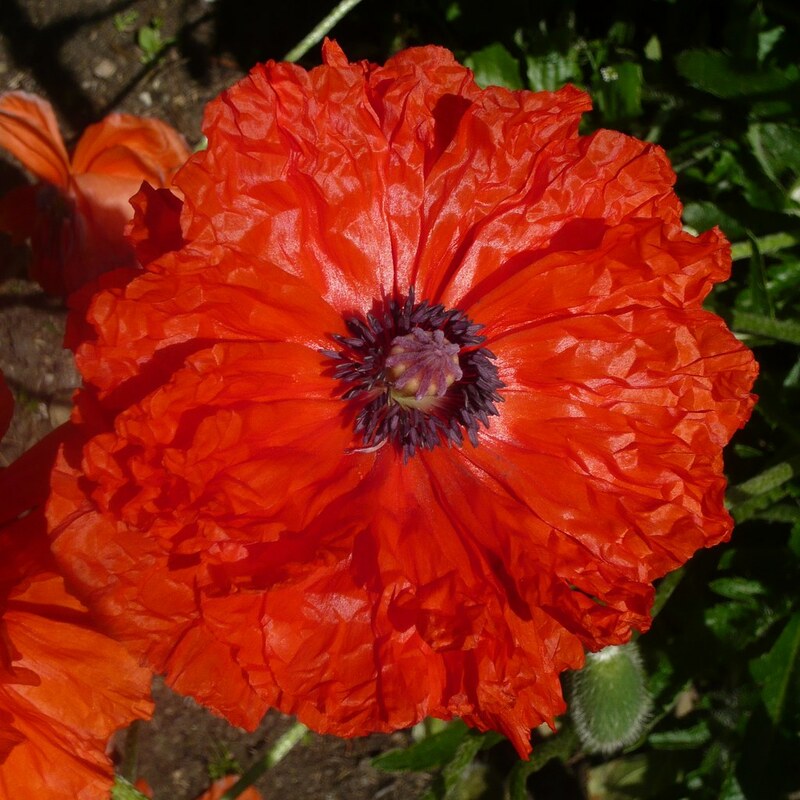 tips for your own garden photography. The Front garden is a great part of English life. Unfortunately there is increasingly a trend to replace the front garden with concrete so people can park a car. But, what better way to start the day than walking through a bit of garden at the front of your house. A bit of gravel and reserved planting gives a very relaxed feel. It helps sooth the nerves, especially because the work to maintain is much reduced. 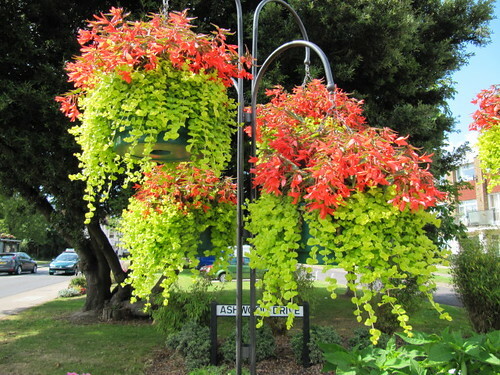 Good hanging baskets with a bold statement can be achieved by using one type of plant in one colour. 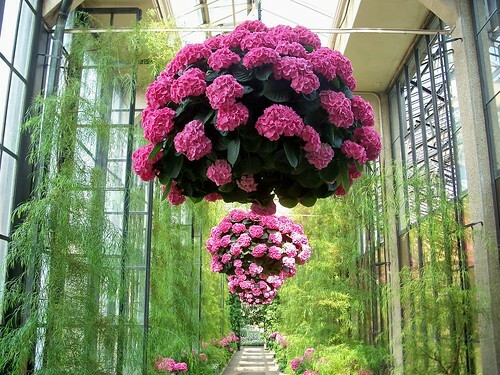 Think about the volume of colour from your chosen flowers over the life of the hanging basket. Keep it simple and you will only need one watering and feeding regime. The hanging baskets below generally fit into the single colour category with the odd liberty. I like the powder blue Lobelia. 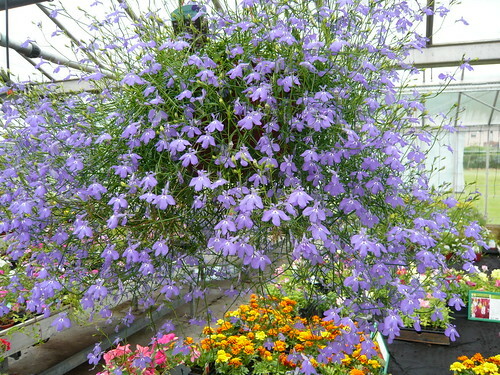 It is far more stunning than the more traditional purple in this large hanging basket. 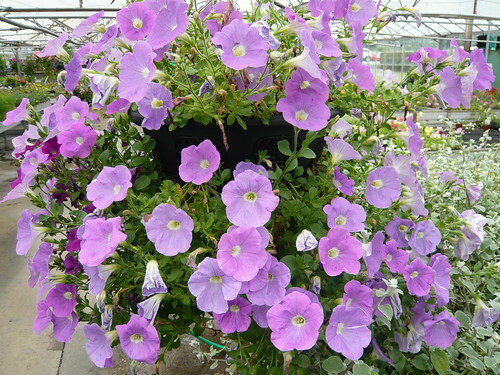 Petunias in purple, or would you call it mauve, are great for hanging baskets as they produce lots of flowers and self-deadhead. 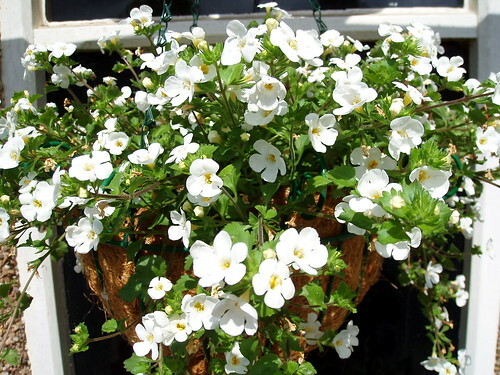 I have not grown Bacopa but like the clean white colour scheme on this hanging basket. Orange is an ususual clour for a hanging basket but there are now some brilliant begonias like these. 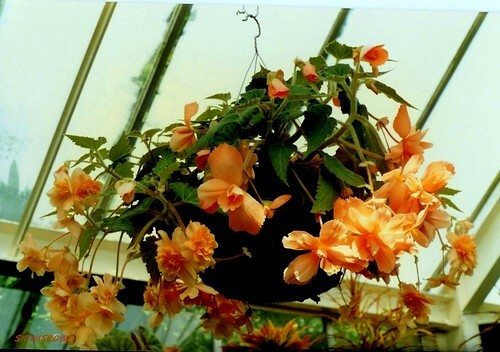 Begonia x tuberhybrida ‘Illumination Apricot Shades’ F1 Hybrid is fantastic but would produce a mix of yellow & orange. Now we get to a cheat with a trailing Lysimachia to under pin the base of the hanging basket which contains red begonias. Is it fair to call this a single colour. Certainly this veined petunia in pink to purple makes a bold splash of colour. 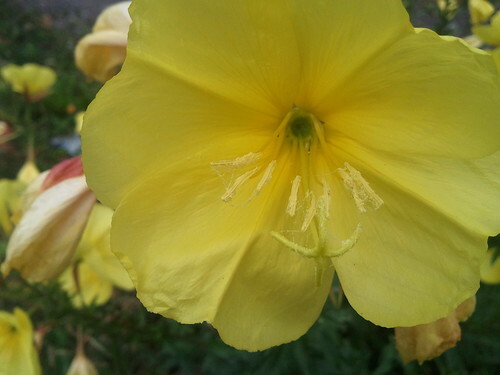 Petunia Million Bells or Calibrachoa are very floriferous plants to try in hanging baskets. This would be my hanging basket display of choice. Hydrangeas drink large volumes of water and would not normally feature in baskets but this USA garden at Longwood makes do. 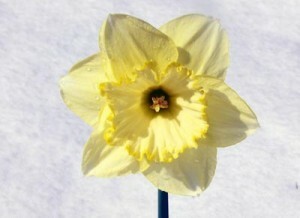 This daffodil still manages to poke its flower above the snow cover. 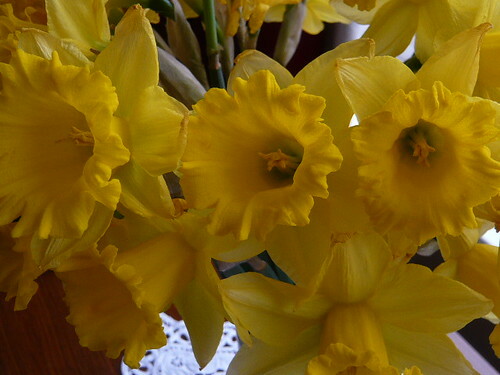 Daffodils are a very hardy flower. 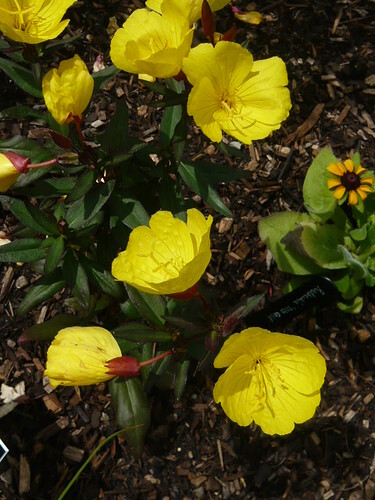 If they are planted at the correct depths and split every 3-4 years they can give years of excellent, maintenance free, displays. 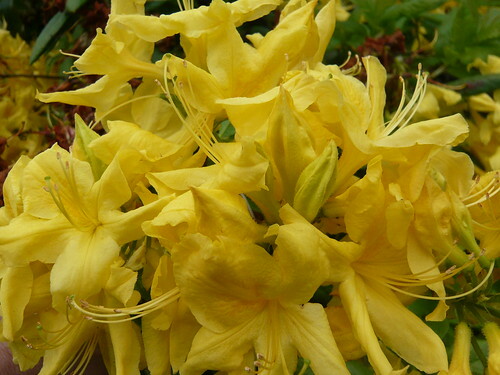 But heavy wet snow can bend or break the flower stems. 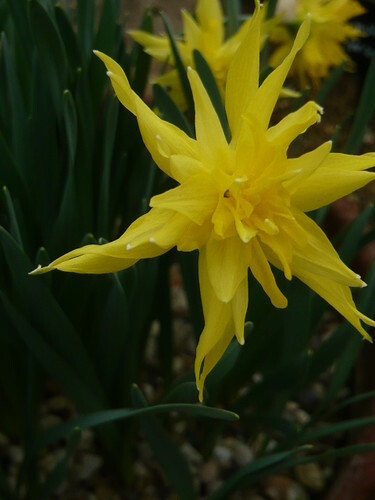 This Rip Van Winkle is a special daffodil with the elongated petals but is still one of my winter favourites. 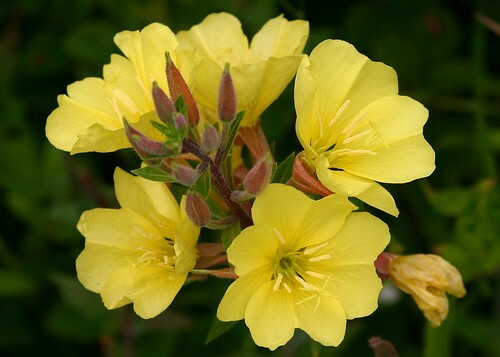 Evening Primrose Oenothera Biennis is a wonderfully scented flower for summer evenings. 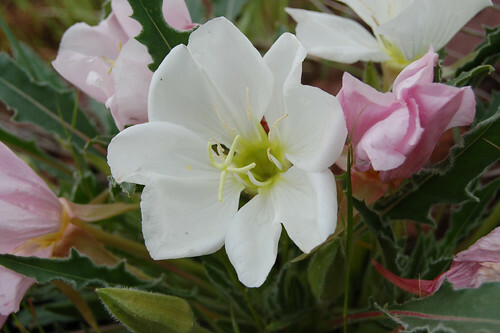 Pink Evening Primrose Oenothera speciosa ‘Siskiyou’ photo of a low growing perennial. Pollination is in the evening air! 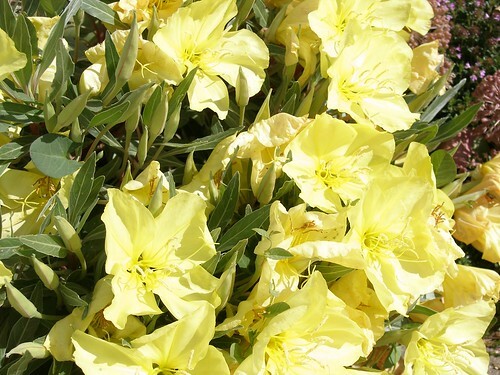 Oenothera Glazioviana is generally a biennial herb producing an erect stem approaching 3-5 feet in height. 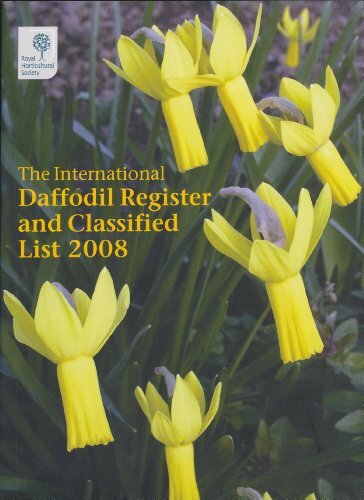 The International Daffodil Register And Classified List 2008 compiled by Sally Kington needs to be studied to be able to name the varieties shown. 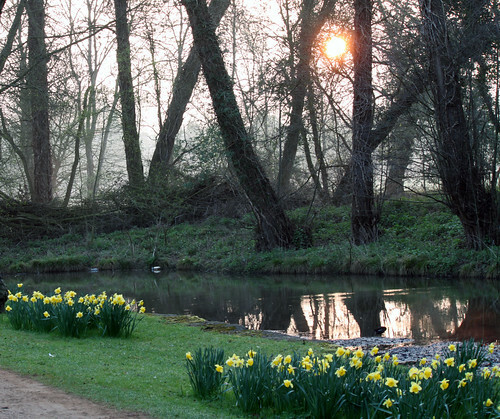 Lady Margaret Hall Oxford April 2010 where studying and gardening went hand in hand. But perhaps more gardening than studying. 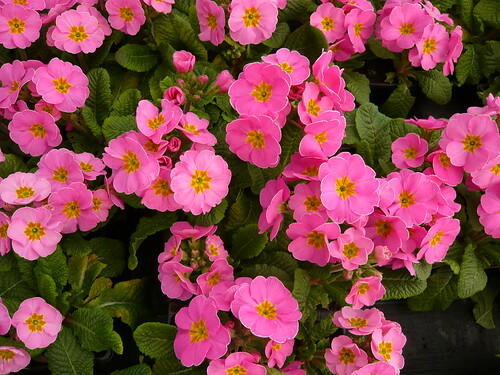 Primroses that bloom in the spring tra-la seemed a good title for these pictures with short pithy comments attached. 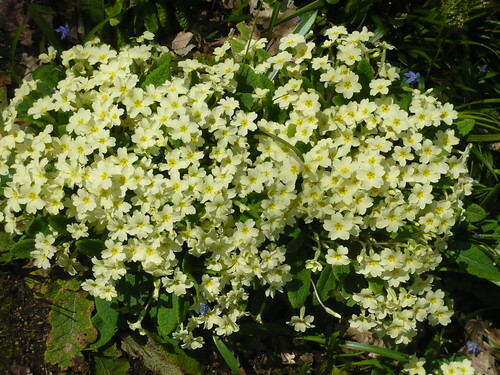 Hedgerow primroses grow well in the shade but flower better when a bit of sun breaks through the woodland branches waiting for their new leaves. 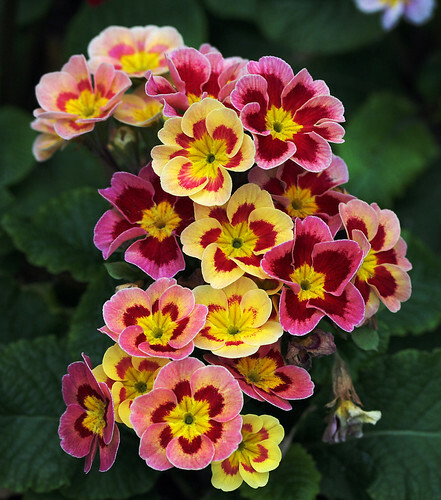 The inspiration for these five pictures of Primrose in their many colours. 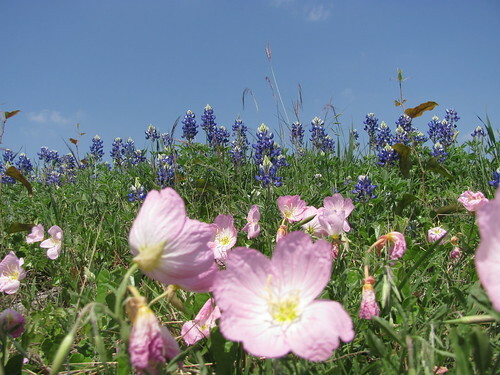 Leaves can die back shortly after flowering. The longer they are green the more they are feeding the roots and plant for future flowering. 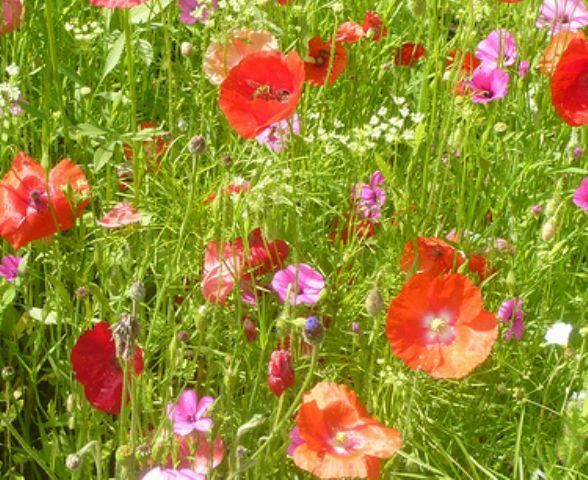 Water and feed after flowering, you would be hungry and thirsty after producing so much seed and progeny. Some colour look good and faithful on computer screens. 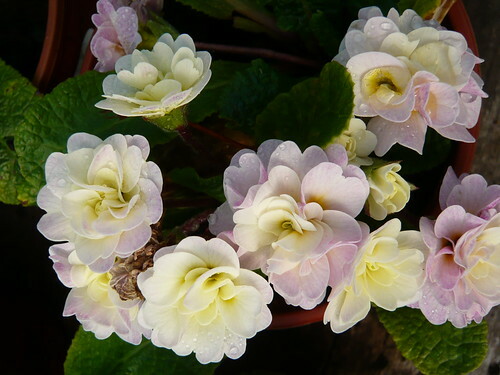 I think that this applies to these Primroses. 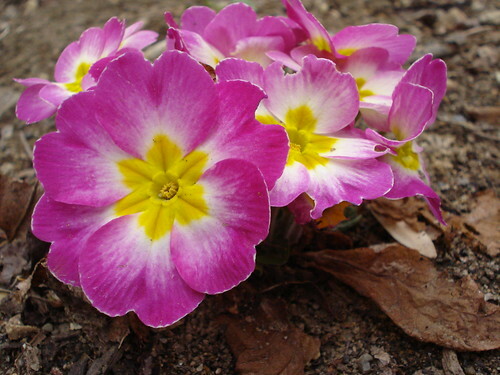 Bred as a double flower this Primrose has interesting colouring. 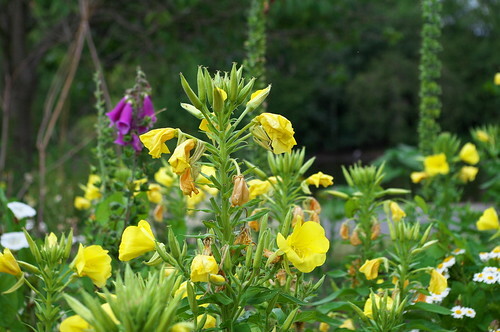 Some plants can be over bred and are then hard to keep from one year to the next. This is the second year of this plant. 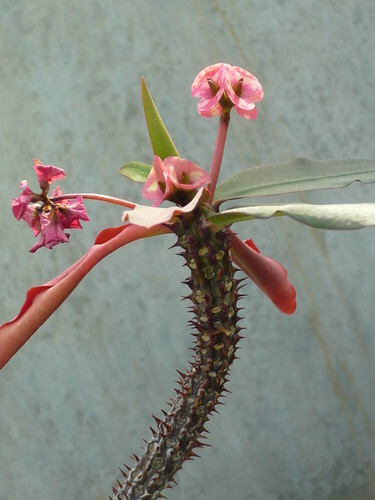 I took this photograph of a flowering succulent in Kew garden arid house in early spring. 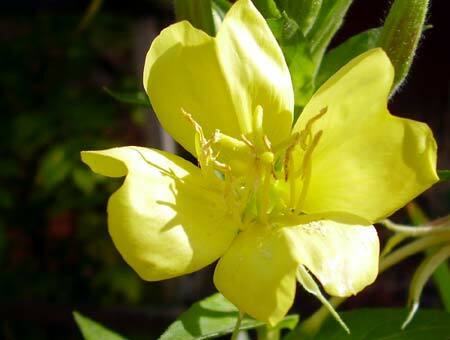 Foolishly I failed to note the name of the plant,. To try to trace some of the pictures I took at the same time I bought a book ‘Exotic Houseplants’ and that led me to look at Luckhoffia beukmanii as a possible species but sadly not. 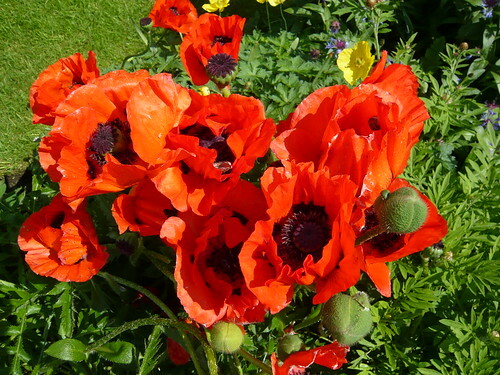 A big bright month for flowers following a lush spring in Yorkshire. 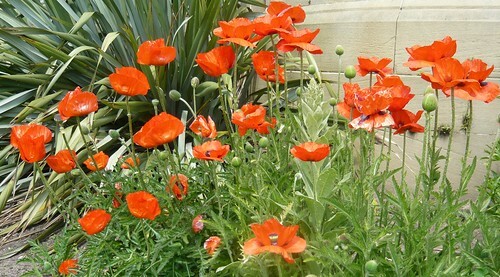 Not all plants behave to the seasonal timetable buy the Poppies are still stunning. 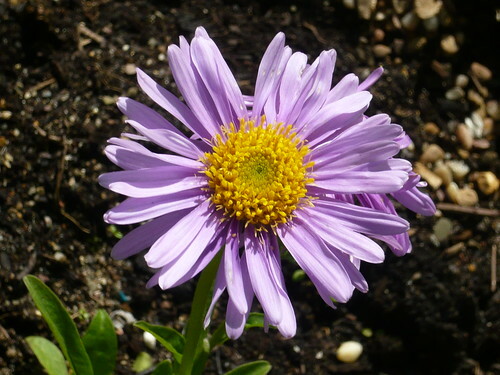 Aster alpinus the Alpine aster – bought from the nursery at Newby Hall in blue, white and purple varieties which are still to flower. 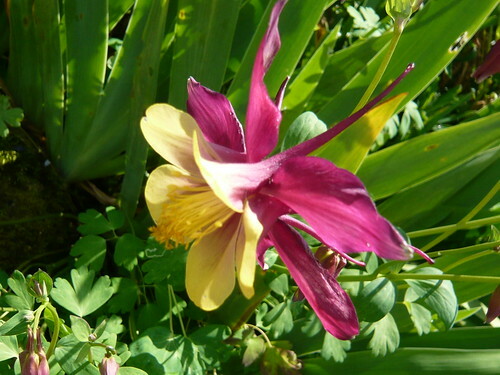 Selfsown Aquilegia or columbine, set off by broad Bearded Iris leaves. 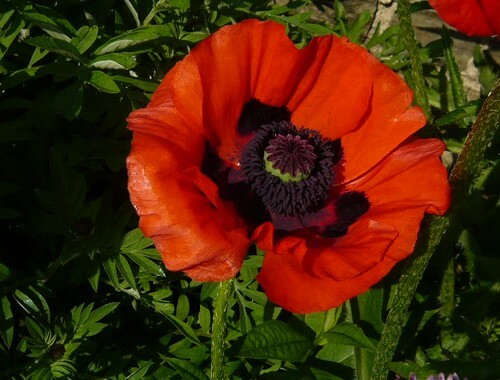 Oriental Poppy that looks blood red late in the day but was glowing in the early sunshine. 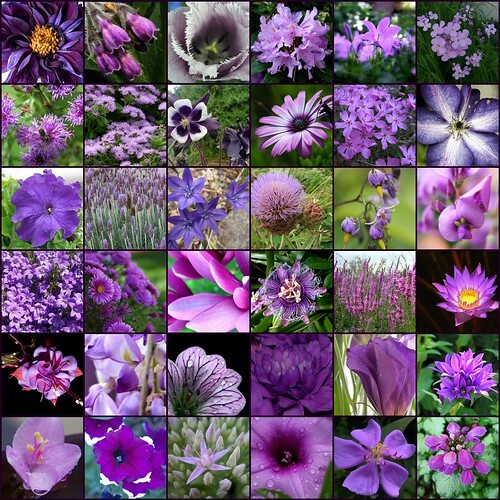 Robyne Jay scores again with more marvelous mosaics made available under CC BY-NC-SA 2.0 license. 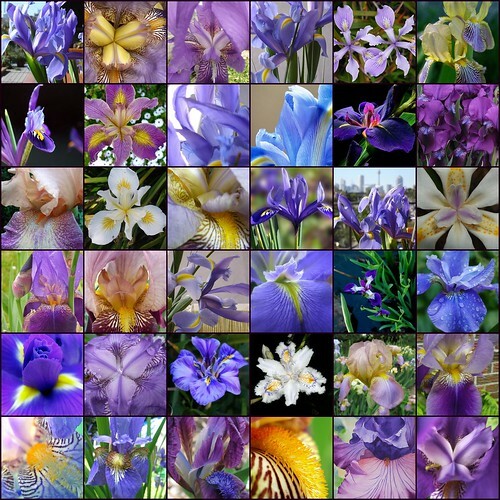 The Iris, part of the Iridaceae family, are my all-time favourites. A shame they do not last long as cut flowers – all the more surprising all these photos were collected.